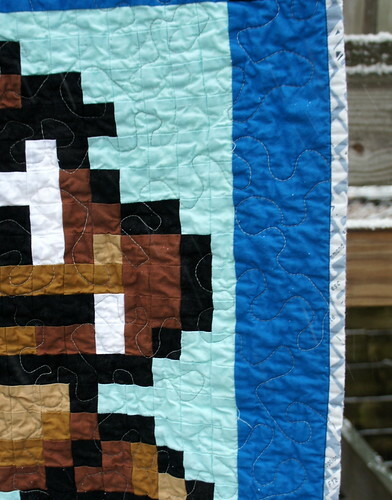 In case you’re wondering, that’s the number of 1.5″ square blocks that are in my Mario quilt. Yes…almost 4,000 teeny little blocks sewn together along with sashing and borders and backing and general craziness. There were some hellish moments along the way but in end, I think you’ll all agree, it was worth it. Honestly I’m getting a little teary over it. Just as a reminder for all those interested, this is part of a QAL that I ran on the blog here and you can find a link to all of the posts in the header under Quilt Alongs. Feel free to start at any time! It’s not going anywhere. My quilt was made with Michael Miller’s Cotton Couture provided for me by The Fat Quarter Shop (thanks Kimberly!) and with Pellon’s stick-n-wash stabilizer and rayon batting (thanks Erin!). Each block is made from 18 x 18 1.5″ squares. And as usual, I completely underestimated the amount of work it would take to make a quilt from 12 of these blocks. On a side note though, I think you still have plenty of time to throw together a single block as a Christmas gift and make a pillow. 😉 You can do it! The mushroom blocks are particularly popular. I know a lot of people were curious about how I was going to quilt this. And I made a decision fairly early on to do an all over meander/stipple quilting. I used a multi colored grey 50 weight thread from Aurifil, #4670 to blend in with the many colors of the quilt. As you can see, it nicely disappears from view, allowing you to see fabulous characters of the quilt. So…conclusions: The good, the bad and the ugly. I really liked using the Pellon stick – n – wash to help me keep this many blocks straight and aligned. I know my strengths and weaknesses and these helped. It’s not the perfect solution but it’s the best that I’ve found yet. Sometimes the stabilizer was difficult to wash off, leaving a bit of residue (I knew that would wash off with the first washing in the machine but the first rinse was a hand rinse). Plus with the wash n dry, the blocks were pretty crisp after air drying….definitely a new challenge when I went to quilt it. And let’s talk about those 3,888 blocks. That means that is a seam on all four sides of each block. I’m thinking that there were at least 7776 seams spread out every inch. What am I saying other than large numbers? That’s pretty difficult to quilt over as it turns out. I wasn’t able to press those seams open which would definitely help in this case. But let’s just say I broke 4 needles quilting this thing and it’s NOT my best quilting ever. Quite possibly the worst. But it’s done and it blends in and it’s washed and so soft now! Also, getting all 12 blocks to be the same size was a challenge. I did square up a couple of blocks, but then thought I could get away with stretching the blocks to size (those 18 seams per side make a difference in “stretchiness”) But as it turned out, the blocks stretched well in one direction and not the other. So major panic attacks were being had late at night at Quilt camp when I was basting it and trying to get it straight. I was pretty much ready throw the whole thing out. No joke. But the beauty of quilts is that they are made to be lived under…not laying totally flat all the time stretched out on a floor. Once it was quilted, bound, hand sewn, and washed this quilt was a thing of beauty. Well at least I could finally see the beauty. And I’m really proud of it. I’m proud of all of you who have made one as well. They are truly labors of love. I know that there are many more in the works and lots of pillows. But here is a glimpse at some of the other finished quilts so far from the QAL. Just amazing. Thank you for sharing this journey with me!! That is an insane number of pieces, but the end result is awesome. I'm planning a Mario pillow for Christmas. We'll see how that works out! It looks awesome! So you'd definitely recommend the stabilizer? I'm going to embark on a Star Wars one (someday) and I worried, while following along with yours, that the washing out wouldn't be worth it in the end. Do you think it would have been better to wash out after sashing? Beautiful! Mine has been put aside until my newborn starts sleeping better but I am so anxious to get back to it. They are all amazing. I have the fabric and the stabilizer to do mine, but just haven't taken the plunge, yet. I will, though. Eventually!!!! Thanks for the wonderful QAL. I followed along! Your quilt is amazing. Thank you for all the words of wisdom that you provided for this quilt. Hope the receiver of this awesome quilt loves is forever! I really love this quilt! Awesome job! This looks amazing!! Even with all the trouble, I'm glad you stuck with it because it's a thing of beauty! 😀 I just recently completed a nyan cat quilt using the same method (although I didn't use wash away stabilizer…that might have been a smart thing to try) and I feel your pain on all those seams and the stretchy one direction but not the other! Gorgeous, I love everything about it! I am wholly impressed. This was a behemoth project and you saw it start to finish! It looks awesome! Congratulations on a fantastic finish Angela! I only made the one Mario block into a pillow but I am planning on making at least 2 more… someday! Thanks for a great QAL!! those little pixelated blocks are just way too cute! The all look awesome, well done! yay for stipple and gray thread! 🙂 It looks FANTABULOUS!!! 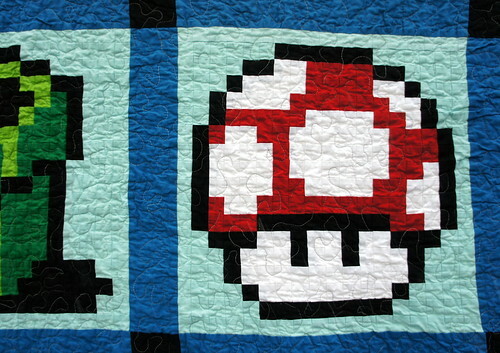 I never did get around to even START one of these, but I am thinking maybe I'll do a mushroom pillow at least, then the whole quilt later……. You're amazing! I got through two blocks. They weren't the same size at all! The second was more of a rectangle and I have no idea what happened. I cried, much like you, and then put it away. I may make them into pillows for my boys now. Congrats on the finish, it looks awesome! Beautiful!!! 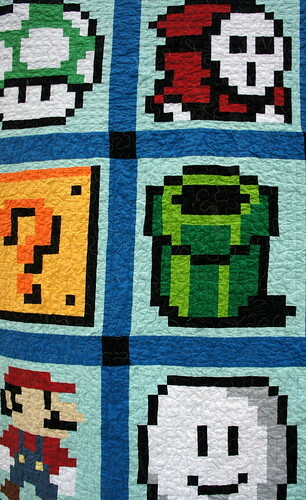 I never told you that I made a Mario quilt for James's birthday. 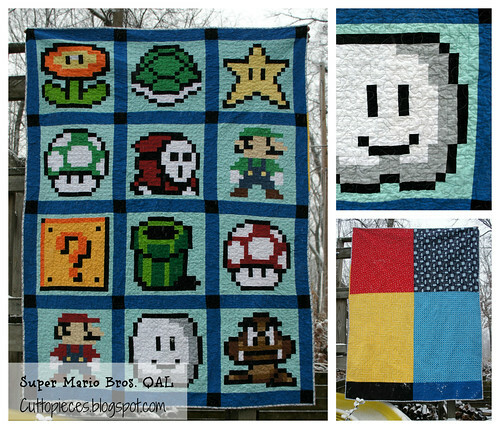 But, I don't have the patience to do the little squares, so I enlarged it & made just Mario out of 4 inch squares. And, I didn't want to buy any fabric, so I searched through my scraps & used a variety of tonal fabrics mixed with solids. I'd take a pic right now, but he's sleeping under it. 🙂 But I will take a pic & send it to you. I think your quilt turned out just beautifully! Great job! Cheers to you Angela! Loved how yours turned out. Thanks for hosting this ! I put a pic of my completed top on Flickr and posting to my blog in am. I did mine without interfacing and it is already the most loved quilt in the bin! This quilt blows my mind! It's so amazing. Thank you for sharing. Ein wunderschöner Quilt !!!! Ich werde auch einen für meinen Sohn ( 29 (:-)))) nähen. Nun sammle ich alle Stoffe, leider sind sie hier in Deutschland nicht alle zu bekommen. Aber irgendwie wird es schon klappen. Vielen Dank für die tolle Idee !!!! I made one of Mario; just enlarged each tiny square to 3.5" so I have a giant pixelated Mario 🙂 Thanks so much for the wonderful idea. I know the frustration of putting together a "postage stamp" quilt such as this. I hand stitched over 10,000 of those little squares to make a queen size quilt top. Took a couple years to get all the pieces together, but then it gave me something to do while watching tv. 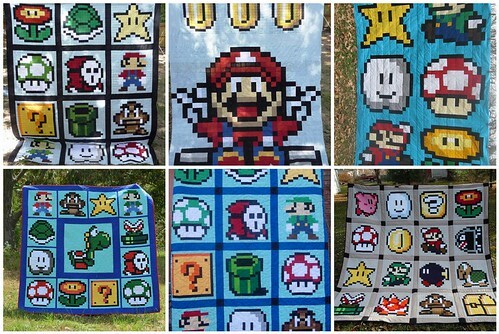 I would make 10 x 10 blocks and then stitch those together. I started out just randomly piecing the blocks, but soon grew bored and started sketching out designs on graph paper, so then I had blocks with hearts and flowers and other designs scattered throughout the quilt. 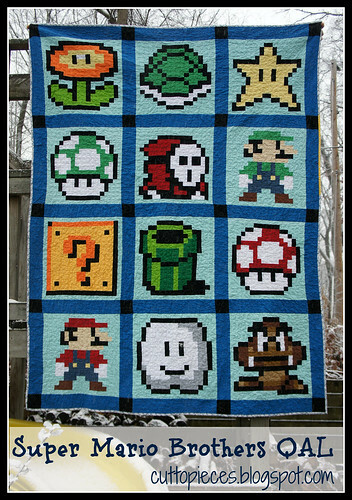 I hadn't thought of creating a quilt with an over all theme such as this one. I have a couple knitting charts of pokemon so that I can use those to create a quilt for my son if my sore hands will let me. Anyway, I showed him the pictures of your Mario quilt and he was very impressed and excited about the idea. Thank you for sharing.